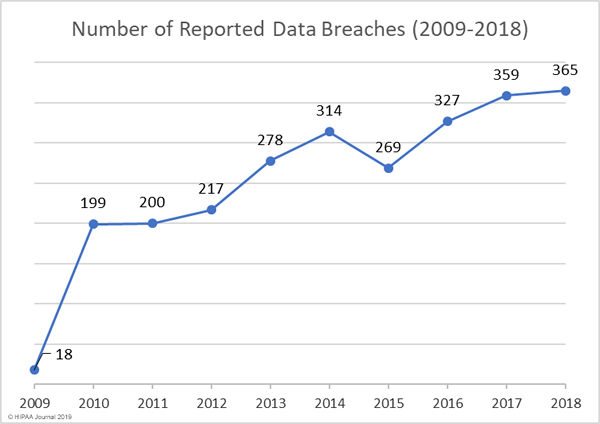 We have compiled healthcare data breach statistics from October 2009 when the Department of Health and Human Services’ Office for Civil Rights first started publishing summaries of healthcare data breaches on its website. The healthcare data breach statistics below only include data breaches of 500 or more records as smaller breaches are not published by OCR. The breaches include closed cases and breaches still being investigated by OCR. 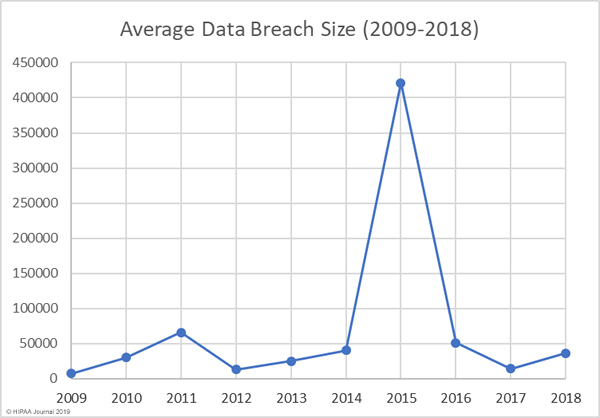 Our healthcare data breach statistics clearly show there has been an upward trend in data breaches over the past 9 years, with 2018 seeing more data breaches reported than any other year since records first started being published. There have also been notable changes over the years in the main causes of breaches. The loss/theft of healthcare records and electronic protected health information dominated the breach reports between 2009 and 2015, although better policies and procedures and the use of encryption has helped reduce these easily preventable breaches. Our healthcare data breach statistics show the main causes of healthcare data breaches is now hacking/IT incidents, with unauthorized access/disclosures also commonplace. Between 2009 and 2018 there have been 2,546 healthcare data breaches involving more than 500 records. Those breaches have resulted in the theft/exposure of 189,945,874 healthcare records. That equates to more than 59% of the population of the United States. Healthcare data breaches are now being reported at a rate of more than one per day. 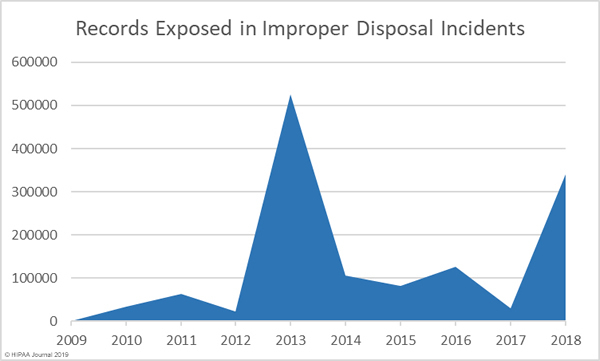 There has been a general upward trend in the number of records exposed each year, with a massive increase in 2015. 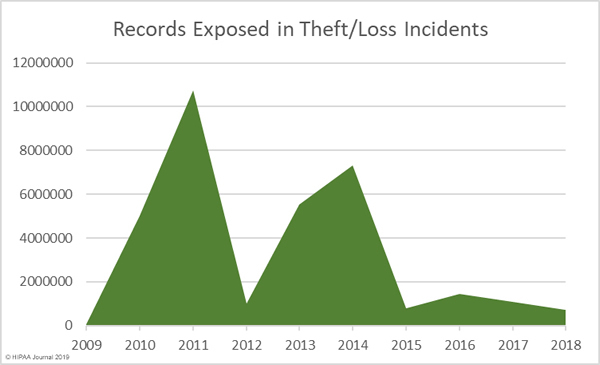 2015 was the worst year in history for breached healthcare records with more than 113.27 million records exposed. 2012 was the best year with just 2,808,042 healthcare records exposed. 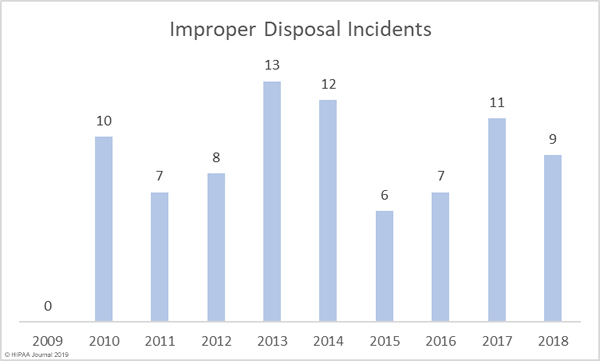 The situation has improved since 2015 with successive falls in the number of exposed records. Although that trend did not continue in 2018. The number of exposed records more than doubled year over year, from 5,138,179 records in 2017 to 13,236,569 records in 2018. Our healthcare data breach statistics show hacking is now the leading cause of healthcare data breaches, although it should be noted that healthcare organizations are now much better at detecting hacking incidents. The low hacking/IT incidents in the earlier years could be partially due to the failure to detected hacking incidents and malware infections quickly. 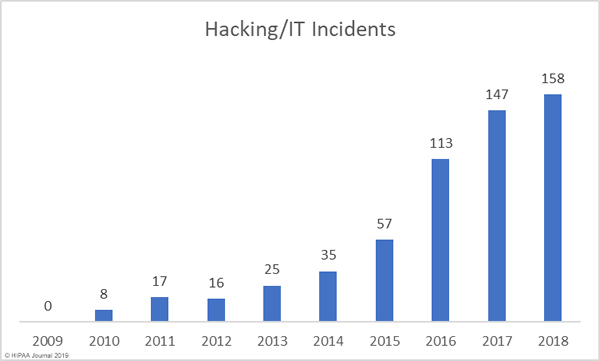 Many of the hacking incidents between 2014-2018 occurred many months, and in come cases years, before they were detected. As with hacking, healthcare organizations are getting better at detecting internal breaches and also reporting those breaches to the Office for Civil Rights. While hacking is the main cause of breaches, unauthorized access/disclosure incidents are not far behind. 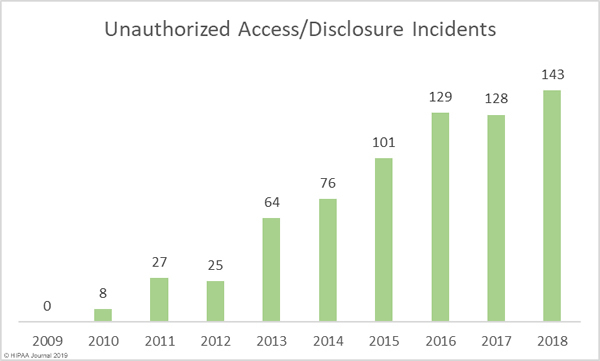 Our healthcare data breach statistics show HIPAA covered entities and business associates have got significantly better at protecting healthcare records with administrative, physical, and technical controls such as encryption, although unencrypted laptops and other electronic devices are still being left unsecured in vehicles and locations accessible by the public. Many of these theft/loss incidents involve paper records, which can equally result in the exposure of large amounts of patient information. The penalties for HIPAA violations can be severe. Multi-million-dollar fines possible when violations have been allowed to persist for several years or when multiple violations of HIPAA Rules have been allowed to occur. 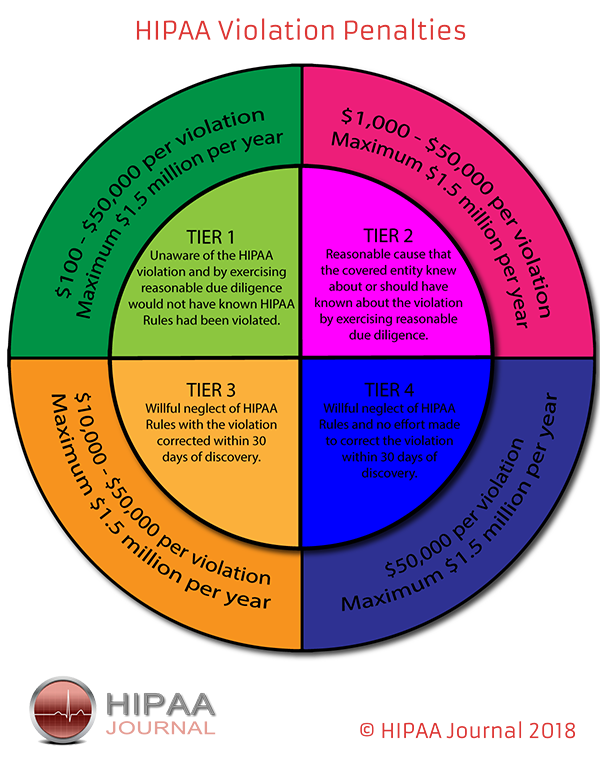 Further information on HIPAA fines and settlements can be viewed on our HIPAA violation fines page, which details all HIPAA violation fines issued by OCR between 2008 and 2018. 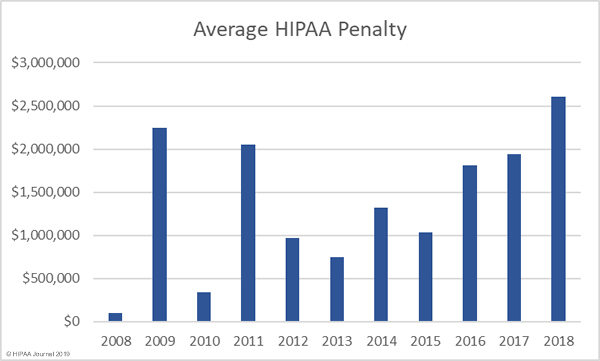 As the graph below shows, HIPAA enforcement has increased considerably over the past 9 years. How Much Has OCR Fined HIPAA Covered Entities and Business Associates? In addition to an increase in fines and settlements, the level of fines has also increased substantially. Multi-million-dollar fines for HIPAA violations are now the norm. 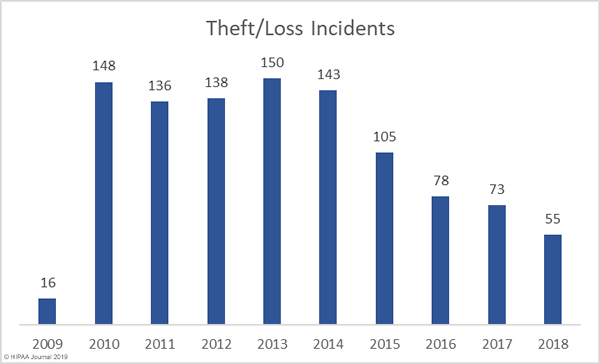 As the above graphs show, there has been a sizable increase in both the number of settlements and civil monetary penalties and the fine amounts in recent years. 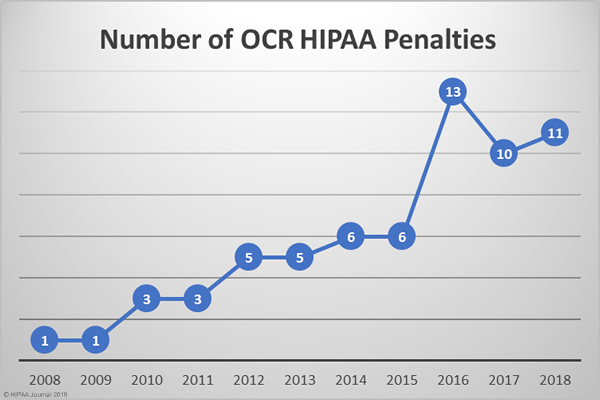 OCR’s budget has been cut so there are fewer resources to put into pursuing financial penalties in HIPAA violation cases, but the fines remain at high levels. 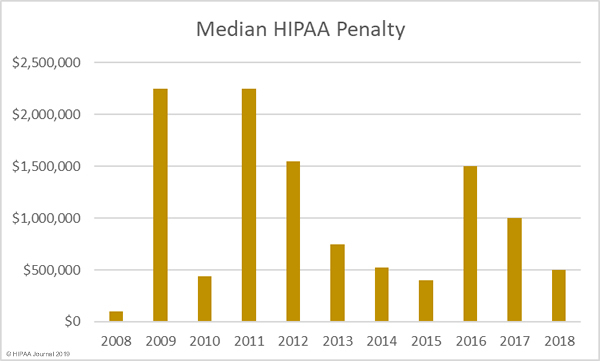 It was expected that 2018 would see fewer fines for HIPAA covered entities than in the past two years due to the budget cuts, but that proved not to be the case. 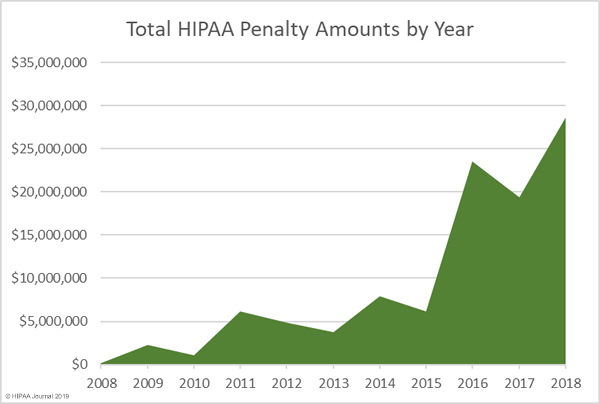 2018 was a record breaking year for HIPAA fines and settlements, beating the previous record of $23,505,300 set in 2016 by 22%. OCR received payments totaling $28,683,400 in 2018 from HIPAA covered entities and business associates who had violated HIPAA Rules. State attorneys general can issue fines ranging from $100 per HIPAA violation up to a maximum of $25,000 per violation category, per year. Some of the major fines issued by state attorneys general for HIPAA violations and violations of state laws are listed below.